Every employee is driven by a different set of needs. Abraham Maslow studied these needs and has a set of five particular needs pertaining to the workplace. Physiological: The most basic; food, shelter, clothing, etc. Safety: Both in physical work environment and job security. Social: People generally look for positive relationships with managers and colleagues, they want to feel like part of a team. Ego: Recognition for a job well done. Self-actualization: Leveraging ones talents and skills to achieve personal and professional goals. Use these types of needs to help assess where your employees fall. Then work from there. First, be as transparent as possible and share organizational goals. Then be sure to provide feedback to help people see how they are contributing to those goals. Treat each other with respect and courtesy. Just because you are a manager doesn’t mean you should talk down to other employees – “please” and “thank you” go a long way. Build in training and reward programs to help everyone grow and see their progress first hand. Couple that with sound HR policies like honest annual reviews and you’ll be on your way to creating a high functioning workplace with motivated team members. 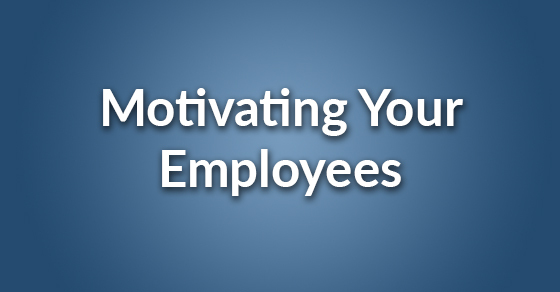 You might not be able to adapt to each employee personally but perseverance in key. Over time you find that people want to be proud of their work and will help you in creating a successful business.